The ‘Social Management Philosophy’ of Suryadatta Group of Institutes, Pune, enunciates its commitment to help all people achieve health and happiness by working as an integral member of society, by sharing values and by offering new values to society through various activities. As these serious social issues cannot be solved solely by those directly involved and require initiatives by the whole of society the expectations towards institutions are also raising in this context. 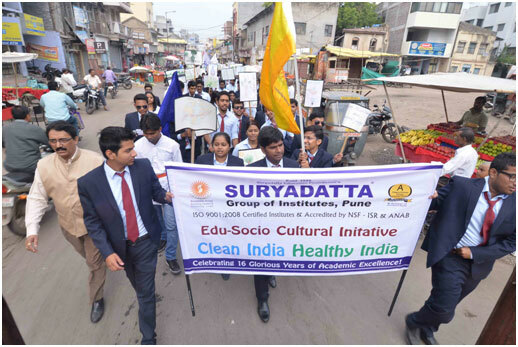 To commemorate Gandhi Jayanti on 2nd October 2014, Suryadatta’s students organized a rally on ‘Clean India Healthy India’ theme. It was an initiative towards creating an awareness which coincided with the ‘Clean India Project’ inaugurated by PM Shri Narendra Modi on the same day. 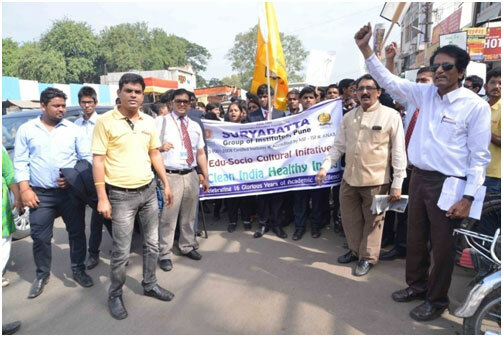 The rally was flagged off by Two freedom fighters namely Shri Shivaji Sambhaji Jindum and Shri Ranganath Balaji Sonawne along with Prof. Dr. S B Chordiya: Chairman Suryadatta Education Foundation & other dignitaries from Ahmadnagar from Delhi Gate. The rally went through Chitale road, Kapad bazaar , Surjepura and reached back to Delhi gate. The rally had a gathering of 300 people. 250 Highly Energetic students of Suryadatta Group of Institutes, Pune, were joined by 50 local citizens. 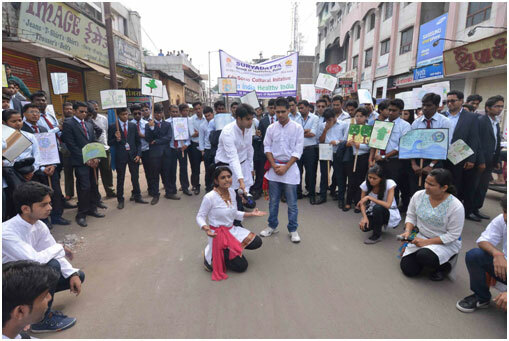 The students, with full enthusiasm, were creating awareness about the theme, through placards and pictures in their hands having various nationalistic slogans written on them viz., “Go Green”, “Save earth, Save Our Planet”, “Be Seen To Be Green” The highly motivated students of Suryadatta were also shouting the slogans like - Our India- Clean India, Our State- Clean State, Our City – Clean City, Our Home- Clean Home for creating responsiveness for the cause. The rally was a grand success. 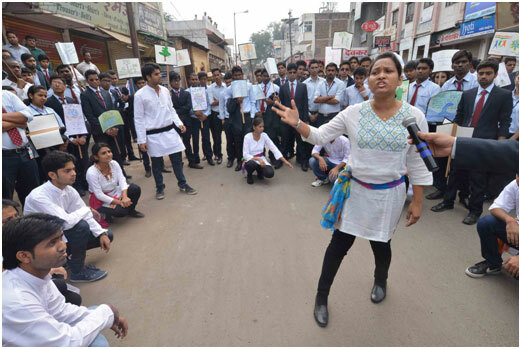 Students of Suryadatta presented a "Street Play" based on the same theme at various places during the rally & the response of the citizens was extremely encouraging. Many citizens joined the rally enroute. 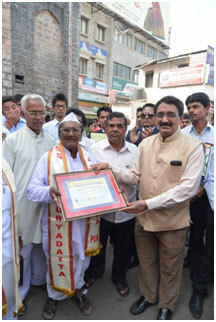 The two freedom fighters namely Shri Shivaji Sambhaji Jindum, age 85 years and Shri Ranganath Balaji Sonawne, age 75 years, were felicitated by Dr. S. B. Chordiya. Mr. Jindam Under the leadership of Swami Ramanand Tirthankar participated in Hyderabad ‘Mukti Sangram’ in 1945 & was imprisoned for 2 years. Mr. Sonawne participated in Goa Mukti Sangram under the leadership of Barrister Nath Pai in 1963 & was Imprisoned & brutally tortured by Portugese police force. Mr. Avinash Dharmadhikari who is voluntarily working for the association of Freedom fighters of Nagar introduced them to the students. 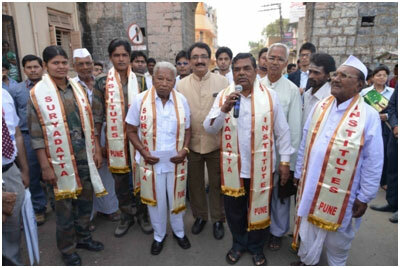 The freedom fighters urged Dr. S. B. Chordiya to start an educational institute of Suryadatta Pune’s status in Ahmadnagar. On this occasion the Founder President & Chairman of Suryadatta Group of Institutes, Prof. Dr. Sanjay B Chordiya said that the concept of making Earth a better place to live in, is what should be the mission of every citizen today. 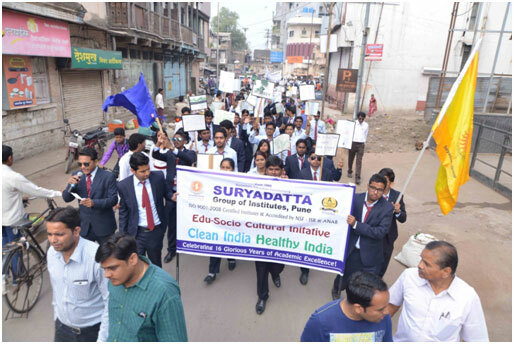 The rally on ‘Clean India Healthy India’ theme was an initiative towards changing the attitudes towards Environmental issues advocating partnership to ensure all nations and people enjoy a safer and more prosperous future. 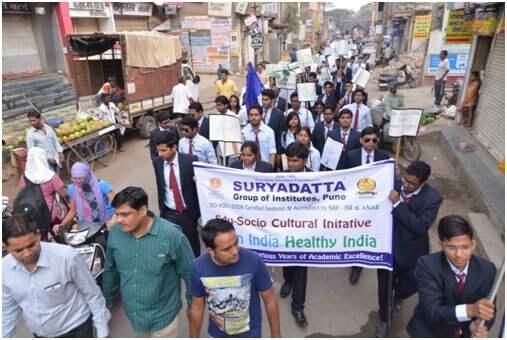 The people of Ahmednagar appreciated the initiative of Suryadatta Group of institutes, Pune for coming all the way from Pune for such a noble cause. 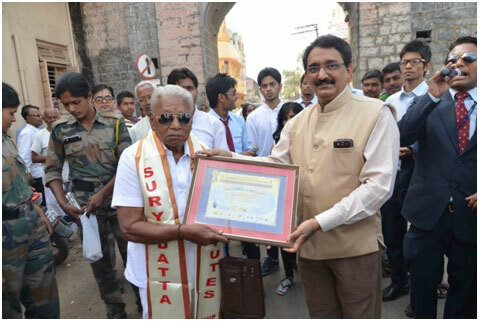 Suryadatta Group of Institutes, Pune, heartily acknowledged the presence of the freedom fighters and the police officers for their untiring support. 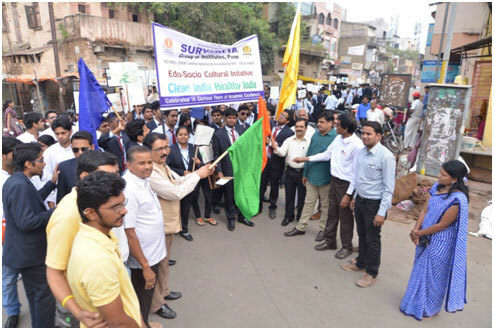 The ‘Clean India Healthy India’ rally at Ahmednagar being flagged off by Two freedom fighters namely Shri Shivaji Sambhaji Jindum and Shri Ranganath Balaji Sonawne along with Prof. Dr. S B Chordiya: Chairman Suryadatta Education Foundation , Pune.